A high quality gas cylinder lift system makes sure you are positioned optimally at your desk, whether it's for work or for racing a few laps! Furthermore, the chair is upholstered with the highest quality real leather look white vinyl. The chair is very stable with an extra sturdy foot and has an adjustable backrest which provides ultimate flexibility. 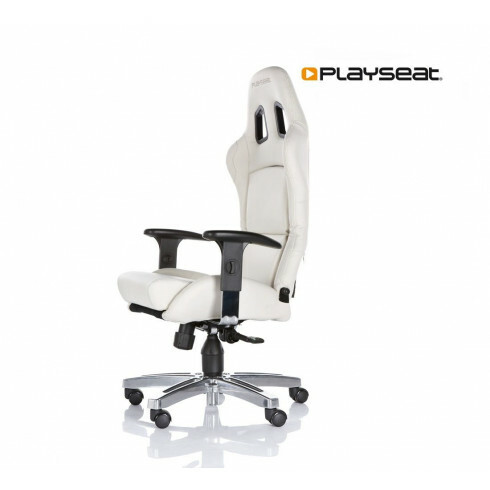 Playseat® Office Chair - White: the great looking sports chair that can be used for work and gaming! I was surprised how high this chair is. It’s fully adjustable but the back support is really high compared to other office chairs. It’s really nice because it gives you a lot better support. Not just the height is adjustable, you can move almost every part of the chair into a position you like, including the armrests. The white leather is a real eye-catcher and it looks very sporty. Maybe not really suitable for real offices but it looks really good in my personal office. I have an office job and suffered from lower back pain for a few months before we reveiced the Playseat Office Seat. I Immediately felt my pain dissolving and the seat felt great. The white exterior matches our desks and the seat itself is very firm and steady. My colleagues all share my opinion, so all we can say is thanks to Playseat for building this great office seat! I work at home a lot and my boss decided to give me this chair as a present. At first I thought this chair might focus a bit too much on looks, but after a few weeks I have to admit this is a great chair altogether. So now I have a chair at home that looks and feels great! The white edition looks way nicer, in my opinion, than the standard boring black edition. The white really makes it stand out. You can tell it’s a high quality product by the nice details. I really love working in this chair because it supports my back very well.